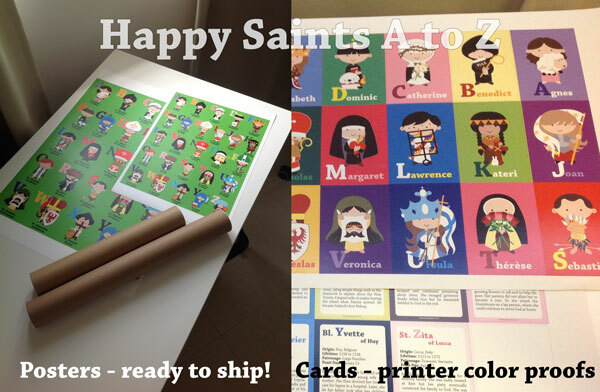 Here’s a progress update on the production of Happy Saints A to Z Cards. I have already emailed download links for the ebook to all contributors. They are sent to the email you registered with Indiegogo. If you did not receive it, please first check your spam box and look for a mail with the subject ‘Happy Saints A to Z eBook’. If there is nothing there, please contact me. The posters are printed and ready for shipping! They will be packed and mailed out next week onward, and you should receive yours in 10 to 14 business days. Posters are printed in A2 and A3 sizes. The artwork sizes are 16x20in and 11x14in respectively. This provides the best flexibility to accommodate availability of standard frame sizes in different countries. The color proofs are in from the printers. I will going through another round of proofing before finally confirming them. It will take another 2 weeks or so before the final stocks are ready. Received my poster in the mail today. It is high quality and bright. I love it so much. It is going up in our school room ASAP! 100% Goal Reached! Happy Saints A to Z Cards!